Did you know that the leading cause of death for children ages 13 and under is due to car crashes? Most of these fatalities are caused by improper seat belt or car seat use. According to the US Department of Transportation, “from 2012 to 2016, there were 3,268 children under 13 killed while riding in passenger vehicles, and these tragic figures have been increasing steadily since 2014. More than one-third of those children were not buckled at all.”4 The vast majority of car crash fatalities are preventable, and our actions can save children’s lives. The best way to protect your child is to make sure they are buckled in for every car ride. It’s also crucial to use the correct car seat for your child’s age, height, and weight. New Hampshire, Rhode Island, New York, New Jersey, and Hawaii have child car crash fatality rates less than half the US average of 2.02 fatalities per 100,00 children. Mississippi, New Mexico, North Dakota, Iowa, and South Dakota have child fatality rates roughly twice as high as the US average of 2.02. New England is the safest region for driving with child passengers; of the top ten states with the fewest child fatalities, 60% are in this region. Of the top ten states with the most child fatalities, Southern states are over-represented at 40%. Western and Midwestern states are split evenly at 30%. The top ten safest states for child passengers have an average fine of $106 for child safety seat law violations.The ten states with the most fatalities have an average fine of only $45. Based on an average of the top ten safest states, only 1.4% of fatal car crashes involve children. In the ten states with the most child passenger fatalities, 4.6% of all fatal car crashes involve children. Utah (7.5%), South Dakota (6%) and Iowa (5.9%) have the highest percentages of fatal car crashes involving children compared to total car crash fatalities. 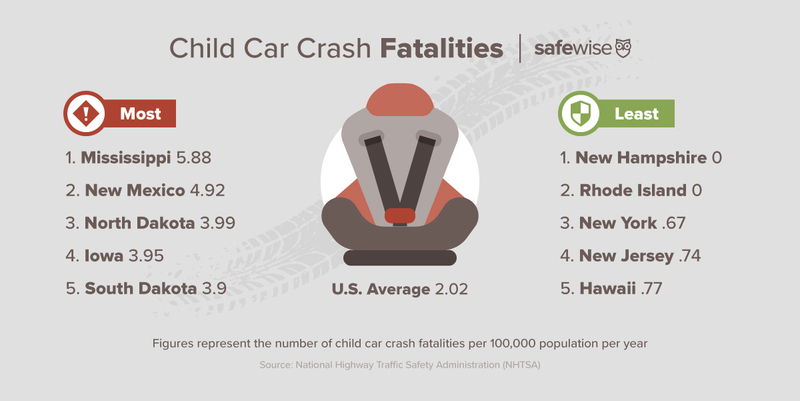 SafeWise analysts evaluated the most recent car crash data from the National Highway Transportation Safety Administration (NHSTA) and child safety seat laws from the Insurance Institute Highway Safety (IIHS) to determine which states in the country had the highest and lowest numbers of child car crash fatalities per 100,000 child population.